As a kid growing up, it wasn’t part of my thought process to wonder why Mr. Rogers did what he did. I just enjoyed tuning into “Mr. Rogers’ Neighborhood” each day and watching him don his sweater and sneakers, feed the fish and sing. Together with million of other kids, I learned that I was loved and loveable and that it was OK to be mad or sad sometimes. Sitting in a theater yesterday watching the new documentary “Won’t You Be My Neighbor?” brought back all the memories of seeing the red trolley taking me into the Neighborhood of Make-Believe where Daniel Striped Tiger, X the Owl, Henrietta Pussycat, Dr. Duckbill Platypus, King Friday, and Queen Sara and others talked about feelings, especially those stirred up by events happening in the world. Directed by Oscar-winner Morgan Neville, the film brilliantly weaves together clips from the show together with archival footage of appearances and interviews with Mr. Rogers. For our full review of the film, click here. 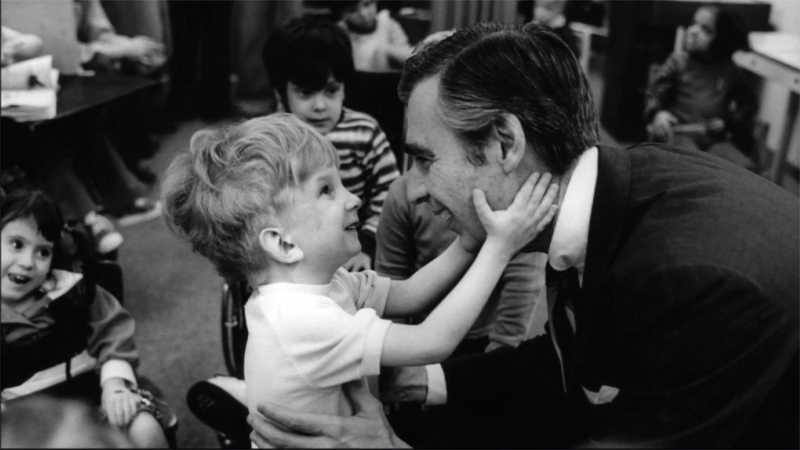 Often surrounded by smiling children, Mr. Rogers exudes genuine concern and attention for each child he encounters. One interviewee, a cameraman for the show, commented that today someone acting like Mr. Rogers would seem weird and strange. We might even wonder if there isn’t some hidden agenda to his actions. It seems like he’s almost too good to be true. Which got me to thinking...why would someone like Mr. Rogers seem out of place in today’s world? Are we not called, as followers of Christ, to embody in our own lives the values Mr. Rogers preached and lived by? In a world where people who try to do the right thing are mocked and labeled “do-gooders,” where normal street conversation is splattered with four-letter-words that no longer seem offensive, where verbal and physical violence is meted out to people every day, where [insert any other social ill here] happens, couldn’t we use more people like Mr. Rogers in our society? As an adult watching this documentary, I was struck by Mr. Rogers’ simplicity and sincerity. In our world today, we often use the phrase “it’s complicated.” Mr. Rogers was not complicated. He spoke his message of love with determination and compassion, never wavering in his belief that if children grew up convinced in their hearts, not just in their heads, that they are loved and loveable, then the world would be a better place, a place where they could be happy. Several times while watching “Won’t You Be My Neighbor?” I was moved to tears. I’m sure some of them came from nostalgia. Others came from seeing a man so genuinely kind interacting with all kinds of kids. In one scene, Mr. Rogers’ lanky frame is sitting in a small child’s chair, right on their level. One little girl hesitantly asks him, “Mr. Rogers?” “Yes?” he responds. She moves closer to him and says, “I like you.” Then she moves into his arms for a hug, and he responds, “I like you, too,” giving her a gentle hug. Still other of my tears came from wishing we had someone like Mr. Rogers in our world today because we sure could use him or her. Then it dawned on me. We DO. It’s you and I. We are the ones who can carry on Mr. Rogers’ legacy of kindness and compassion, acceptance and tolerance, if we so choose. We might not have the influence over millions that he had but we can start by being genuine and loving with the people around us: our children, other family members, those we work with, those we meet while commuting to work via public transportation, or those we might otherwise pass on the street without even noticing. Without coming out directly and saying it, Mr. Rogers believed that each and every one of us is a child of God. As such, we need to treat every other person with the dignity and respect due to them. That includes people we don’t naturally like or those who see things differently than we do. Loving those who love us in return—that’s the easy part. What’s hard is loving those who don’t return our love. So, when you see “Won’t You Be My Neighbor?” and wish there could be more like him, why not take Mr. Rogers up on his invitation and renew your efforts to be “neighbor” to all you encounter. I know I will.